Writers from around the world are joining a project launched by an ambitious young science fiction writer from Russia. Together, they will create the Universe of Metro 2033, sending their characters into the post-nuclear world. In a secluded two-storey house on the edge of a Moscow park, a short young man with penetrating eyes, dressed in a leather coat, is addressing an audience of about a hundred young men, telling them nothing less than a plan to take over the world. Masked people in camouflage uniforms guard the entrance. No, this is not a secret meeting of some clandestine organisation seeking to rule the world. It is just a meeting of the fans of the post-apocalyptic saga Metro 2033 with its creator Dmitry Glukhovsky and British writer Grant McMaster, who has picked up the slack. Almost ten years ago, 22-year journalist Dmitry Glukhovsky wrote a rather unusual story about survivors of a nuclear disaster of 2013. The publishers were not particularly enthusiastic about it, especially disliking the end, where the main character dies, leaving no hope of sequels. Rebuffed by publishers, Dmitry posted all 13 chapters of his novel online and went on with his journalistic work. Little by little, the Metro 2033 website gained popularity. Thus encouraged, Dmitry returned to his manuscript two years ago, considerably reworking it. Then he offered it again to publishers, this time backed by thousands of potential readers. 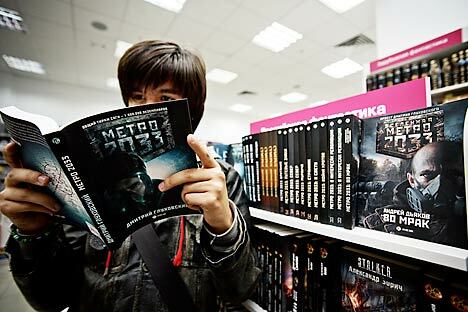 The result exceeded all expectations: Metro 2033 has been reprinted several times in runs of more than 100,000. The readers asked for more metro adventures and they soon got what they wanted. Yet this was not enough, as post-apocalyptic adventures proved so much in demand. That is why, three years ago, Dmitry Glukhovsky, by that time already a popular radio presenter and author of several books, launched the Universe of Metro 2033 project. The idea was simple: different authors describe a single world. “All the novels complement one another. There are no genre limitations. It is not the genre but the setting that unites it”, the project’s founder explains. Another important condition is that the author should know just as much as his hero, while the rest of the world is shrouded in uncertainty. “There are no tough restrictions for the authors; everyone contributes something new. As a scientific experiment, this is great”, Glukhovsky believes. His novels have been translated into 35 languages and the books of the project’s other authors are also being translated. Dmitry is getting responses from all over the world. All this has propelled the project on to the next stage. “Last year, British writer Grant McMaster got in touch with me on Facebook and now our project has its first book written by a foreign author”, says Dmitry, apparently happy about this. Indeed, writers from the United States, India, Cuba, Italy, and Japan are also keen to join in the apocalyptic project. “It is our ambition to conquer the entire world”, Dmitry smiles. Next in line is The Roots of Heaven by Tullio Avoledo, set in post-apocalyptic Italy, in Rome and Venice. The main character is a Catholic monk who sets out on a journey at the request of Enclave Cardinals.